A big thanks to everyone we paddled with over the past year, and especially those who took the time to share details of their experience on TripAdvisor®. 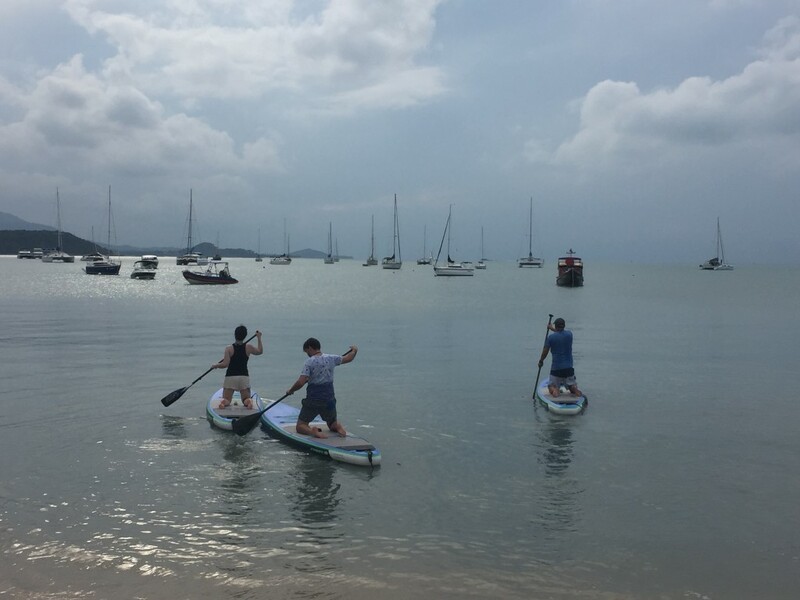 We’ve loved paddling with you all – and hope to see you again sometime in Samui. Click here or on the TripAdvisor logo below to read some of our reviews. If you’re in Samui for a healthy holiday then you’ll want to pitch up at some of these spots to refuel after your paddle, yoga class or beach walk. We’ve enjoyed eating all of these places and hope you do too. Treehouse on Silent Beach – This is how Samui used to feel about 10-15 years ago, but now with all the modern conveniences of healthy food and fast wifi! It’s a great place to hang out for a few hours, enjoy some fresh Thai food, healthy western options and great zingy fruit shakes. There’s also a small massage place on the beach. We sometimes stop here for lunch or fruit shakes during one of our north coast paddle tours. The Yogarden Cafe – my favourite spot for yoga, fruit shakes, healthy food – and just hanging out! Treat yourself to the Banoffee pie after your class. Located in one of the side streets in Fishermans Village. Open Monday – Friday, and half day on Saturday’s. Greenlight Cafe & Bar – wide range of smoothies, scrummy salads and wraps that will keep vegans and pescatarians equally happy, plus a good selection of desserts and coffee. Drop by for their daily yoga classes and on Friday night for their Salsa Party. Open every day. June’s Art Cafe – June has been feeding the bright-eyed souls of Koh Samui for more than 10 years (and probably much longer). My favourite dishes are the Pesto Fish Salad and Ian raves about the chicken sandwich. They also have some delicious healthy desserts that are all made on the premises. Prava – Located on the walking street in Maenam, this is a sweet little cafe with loads of options for everyone! I love the salads and fruit shakes. Absolute Sanctuary – Drop by for a yoga or pilates class and stay for a freshly pressed juice at the pool bar, or a tasty lunch in the Love Kitchen. Last time I had their seafood quinoa risotto for lunch – tasty and good for your belly! Tanya’s Cafe – a sweet little cafe on the very south end of Chaweng Beach Road. I can recommend Tanya’s gluten free cakes and chai latte’s (call ahead and she might even be able to source Almond Milk for you). And she also makes a delicious Thai appetiser called Miang Kom and some other simple dishes. And I’ve heard her coffee^ is good too! Vikasa – If the sea view doesn’t nourish your soul, then the wonderful range of juices, salads, soups and wraps will. Drop by for a yoga class, and stay for brunch! My favourites are the Mediterranean Plate or Salad Bowl (sometimes with a serve of hand-cut Sweet Potato fries). Mmmm! Sweet Sisters Cafe – We encourage everyone to get off the main ring road and explore the southern part of the island. You’ll love the quiet roads and sleepy beaches. Stop by Sweet Sisters for breakfast or lunch and you won’t be disappointed. It’s part of the slow food revolution, so be prepared to wait a little while for your meal. ^We both gave up coffee a few years ago. Ian tries the occasional decaf coffee, but I mainly stick to fresh coconuts and hot tea. We often get asked to recommend Thai restaurants in Samui. When I’m put on the spot it’s hard to explain where some of the small restaurants are, especially when we’re out on a paddle board and can’t just reach for my iPhone. So I thought I’d list a few of our favourites here, to make it easy to share the details of our favourite places to eat. This is still a work in process. I’ll continue to update with photos and a price range for each restaurant. Krua Choeng Mon – a small family run Thai restaurant in Plai Laem (not far from where we live). We often go here for lunch and dinner. The food is consistently really good and it’s not expensive. You can get beer, fruit shakes and coconuts. It’s located on Plai Laem Soi 10, just behind the 7-11. Crystal Restaurant – we’ve been going to this family run beachfront restaurant for over 15 years, and we still love their Crab Meat Curry. They have an extensive Thai and Western menu. You can also use their sunloungers if you fancy hanging on the beach for a little while before/after your meal. The tables are laid out on the beach at night for dinner. Pui Relax Restaurant & Bar – this is a sweet little Thai restaurant close to the Choeng Mon post office, on the road between Choeng Mon and Chaweng. Delicious food and some daily specials. Small Thai restaurant opposite Choeng Mon post office: great little spot with 50 Baht meals. Food is fresh and tasty. And friendly owners. Great option for lunch. I think they close around 7pm most days. 60 Baht Lunch Cafe – Not sure what the name is, because it doesn’t have an English sign out front. But most of the meals cost just 60 Baht. It’s a popular with the Samui residents – we know some people who go for lunch 5 days a week! It’s opposite Saboey Resort and next door to a little Cafe and massage shop. It’s only open for breakfast and lunch, and serves a range of noodle and rice dishes for around 60-80 Baht per plate. Our favourites includes Squid with Garlic and Pepper (Pla Mook Kratiem), Chicken with Chilli and Basil served with a fried egg (Pad Krapow Gai Khai Dao), and Fried Kale with Crispy Pork (Pad Kanaa Moo Thawt). Shambala – a lovely Thai restaurant close to Big Buddha. Really friendly owners, yummy food and good prices. My favourite is the Shambala special curry. I usually have it with prawns, but it’s equally as nice with chicken. 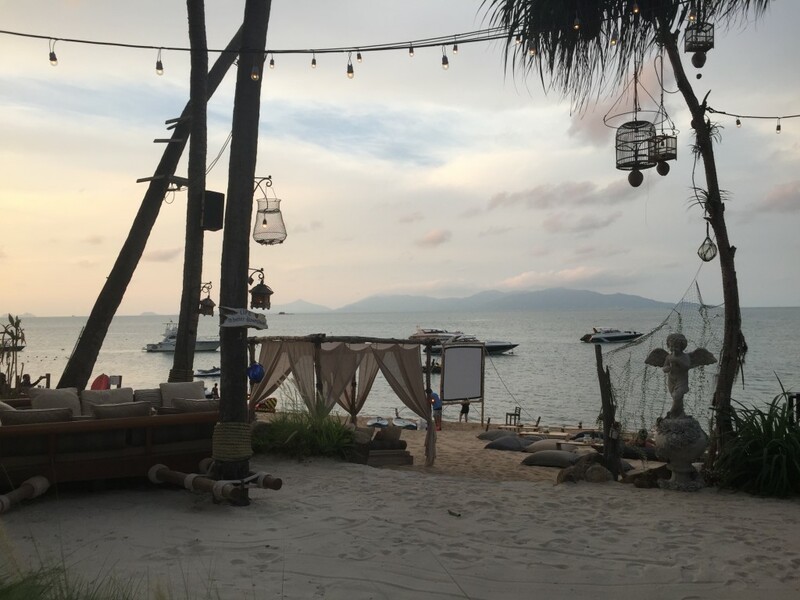 Sunset By Angelina – this is one of our favourite restaurants/bars in Samui. Go here for the amazing sunset views, chic ambience, fab cocktails and yummy food. Plus the owners and staff are super friendly. There’s a great mix of Western food such as steaks, burgers and ribs, and a good selection of Thai food with a twist (our favourite is the Red Curry Clams, but I also like the Snapper with Black Pepper and Garlic). It’s not the cheapest place for Thai food, but you won’t be disappointed. Secret Garden – a beachfront restaurant with great Thai food and western choices too. Last time I was there I had a Pomelo Salad with Prawns. Western breakfasts are pretty good and they also have specials on most nights, such as “All you can eat Ribs” on Thursdays, and “Live Music with a Thai Buffet” on Sundays. Jungle Club – a real favourite with the Samui residents. We can easily spend a few hours up here – the food, views and fruit shakes are great. Call ahead and book a Sala (pavillion). It’s a steep road going up to the Jungle Club, and fairly easy to drive up if you have a 4WD or motorbike. We leave our car at the bottom of the road and call for their 4WD transfer service. Call 081 894 2327 / 081 891 8263. Tanya’s Cafe – a sweet little cafe on the very south end of Chaweng Beach Road. I can recommend Tanya’s gluten free cakes and chai latte’s, but she also makes a delicious Thai appetiser called “Miang Kom” and some other simple dishes. And I’ve heard her coffee is good too! The Address – We take our visitors here when we’re up for a seafood feast. They have a selection of set menu’s, and we usually order the one for 3-4 people for around 3000 baht. It includes fish, prawns, lobster, squid, clams, mussels, salad and rice! You get loads of food and can choose how each dish is cooked. If the weather is nice, choose a table down on the beach front. Directions: located in the Fishermans Village, near CopaCabana. Cafe 69 – Awesome fusion Thai food and a super friendly owner. We love the food and the atmosphere at Cafe 69. Our favourite dishes are the Green Curry Pie and Red Curry Duck dumplings (both appetisers). The portions are very big, so don’t over order. For 6 people, 4 mains and 4 starters was enough. It’s located on the Ring Road in Bophut, almost opposite the entrance to The Wharf car park. Give it a try! But make sure you call ahead to book a table! My Cafe & Restaurant – Located on a side road close to the Bophut Traffic Lights, this is a great little place to hang out for a couple of hours. The cafe overlooks a small lake and you can choose to sit in the openair house or the new air-conditioned building. The fruit shakes are amazing works of art and super tasty. And the food is pretty good here too (they serve both Thai and western dishes). Bar Baguette – One of our favourite beachfront cafes. Simple Thai dishes, western meals. You can also get poached eggs, pastries and coffee for brunch. A great place to chill out during the day or at night. It’s at the front of The Wharf shopping centre in Bophut. Open from 8am every day. Sometimes we paddle from Bangrak across to Bophut and can stop at Bar Baguette for breakfast or coffee at the end before heading back to your resort. Fishermans House Cafe – A gem of a cafe in Fishermans Village – in a classic old Thai style house. It’s run by the same owners of Bar Baguette, so you’ll find a similar menu of simple Thai dishes. Plus you can get breakfast, pastries and coffee. Open from 8am every day. Spices Cafe – This is now one of my favourite fusion Thai restaurants. Make sure you call ahead to book a table, as it gets busy. We had some fantastic dishes including Soft Shell Crab with Penang Curry, Fried Fish with a special sauce, Southern style curry beef (red curry). Think & Retro Cafe – this little gem on the south end of Lipa Noi beach also reminds us of what it was like in Samui around 15 years ago. They have an extensive selection of Thai food, western dishes and pizzas!! We love their Lemon-Mint shake and their fresh passionfruit soda. You might even want to stay overnight in one of their funky bungalows, made from old sea-shipping containers. Lipa Noi is usually a great spot for paddling from January – April, the water is nice and calm and there’s very little wind! AM Samui Resort – we usually stop here for lunch after our Five Islands Longtail SUP Tour. They have a great range of Thai dishes. My favourite appetiser is their Chicken Satay which is served with the skewers sticking out of a pineapple. It’s a lovely spot to hang for a few hours, and you’ll get great sunset views too. Uncle Rang’s – A great little restaurant just a few steps from a quiet beach. We sometimes take our paddle boards and paddle from the beach in front of the restaurant and then stay for lunch or dinner. Good food. Friendly service. And as long as it’s low tide, it’s a lovely spot for a stroll along the beach. Located next to the Renaissance Hotel. Take the side road off the ring road – signposted to the Renaissance and the Banyan Tree. Kob Thai – An authentic Thai restaurant in a quiet garden setting, just off the main ring road. Friendly owner and fantastic food. I’ve been for lunch on my own, and also for dinner with a group of friends. There’s a small pool that you can use as well – great for little kids because it’s really shallow. Chai’s Cuisine & Farm – This is as fresh as it can get, and run by a super friendly and down-to-earth couple. Khun Chai and Khun Rut grow their own vegetables in the garden behind the restaurant and will freshly pick what they need after you’ve placed your order. We love their Prawns with Chilli & Basil (Pad Krapow Goong) and Morning Glory (Pad Pak Bung). Well worth the drive south to try their food. Ask about their Thai cooking courses too. Yum! Directions: Located on the ring road about 500m before Wat Khunaram (if you’re driving from Lamai). There is a map on their Facebook page (click here). Take a look at our Guide to the beaches in Koh Samui for more information about where we like to hang out on the island. We will be attending the 6th Annual ‘Fun on the Beach Day’ for the children of the Nakhon Orphanage on Saturday 24th September 2016. There will be around 100 children participating in all sorts of fun activities on the beach at Khanom (on the mainland). The iSUP Samui crew will be providing paddle board lessons and general water safety. If you are interested in volunteering at this event, please visit the event page on Facebook, and reach out to the organisers. Coral Cove is known as one of the best swimming spots on the island, especially during the summer months (May-September) when it’s protected from the wind. The water is clear and the sand is white – which also makes it a great spot for stand up paddle (SUP) boarding. Our Coral Cove SUP tour is a lovely paddle along the south-east corner of the island. It’s part of the coastline between Chaweng and Lamai, and surprisingly Coral Cove it’s a quiet stretch to explore. We usually paddle around out of Coral Cover towards Crystal Bay, where we stop for a swim. And then we paddle onto the secluded bay in front the Banyan Tree Resort. If we’re out on the water early enough we can paddle around towards Chaweng Noi, just making sure we’re away from the jetskis. 1500 Baht per person, includes paddle boarding equipment and bottled drinking water. Transfers are included if you are staying in the Choeng Mon, Bangrak or Bophut areas. Other areas by arrangement (and possible extra cost). Click here to book your Coral Cove SUP tour. Don’t even think about visiting Australia without jumping on a paddle board! We were visiting family and friends in Sydney recently and took the opportunity to get out on the water a few times with our SUP mates. We love paddling on Sydney Harbour, even if it’s only the beginning of spring and the water is a little cooler than what we’re used to in Thailand. 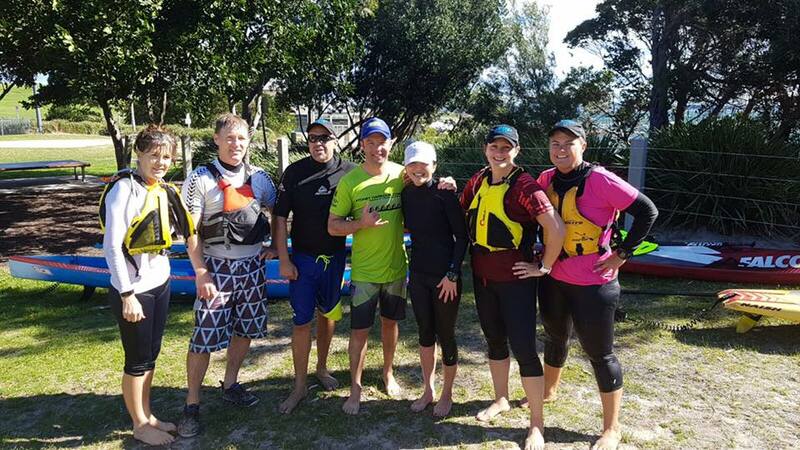 Ian joined Traci and Rod for a harbour paddle on Saturday 27th August, and then on Sunday 28th August we joined 40 paddlers in the Balmoral SUP-X Series. We paddled to 5 separate beaches around Middle Harbour. It was a beautiful morning out on the water. Check out this amazing drone footage of the race here. If you’re ever in Sydney, why not take a lesson with the friendly guys at Balmoral Paddlesurf. We were lucky to demo a couple of their Lahui Kai 14′ paddle boards. Tammy joined a sunrise paddle with the guys from Sydney Paddle Surf Club on the first day of spring. 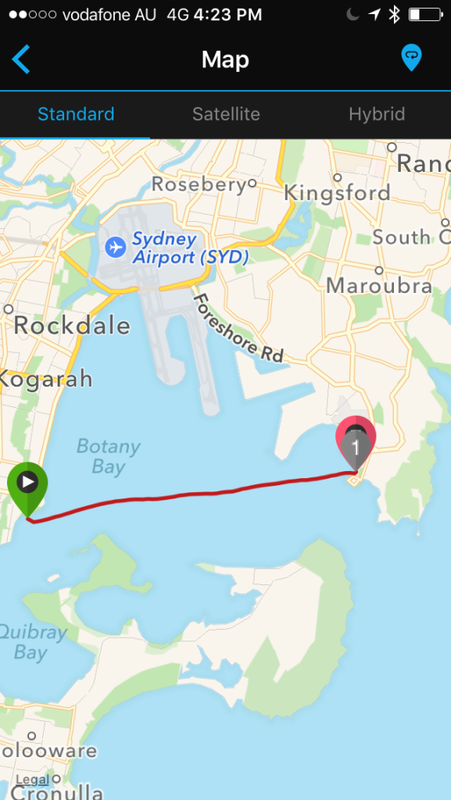 Traci and the guys were on 14ft carbon race boards and they set off from Clontarf towards Manly. Tammy in the meantime was cruising on a borrowed 12’6 inflatable paddle board, just enjoying the magical sunrise over North Head. Tammy joined a sunrise paddle in Clontarf with Traci and the guys from Sydney Paddle Surf Club (SPSC). That’s Balmoral beach in the background. 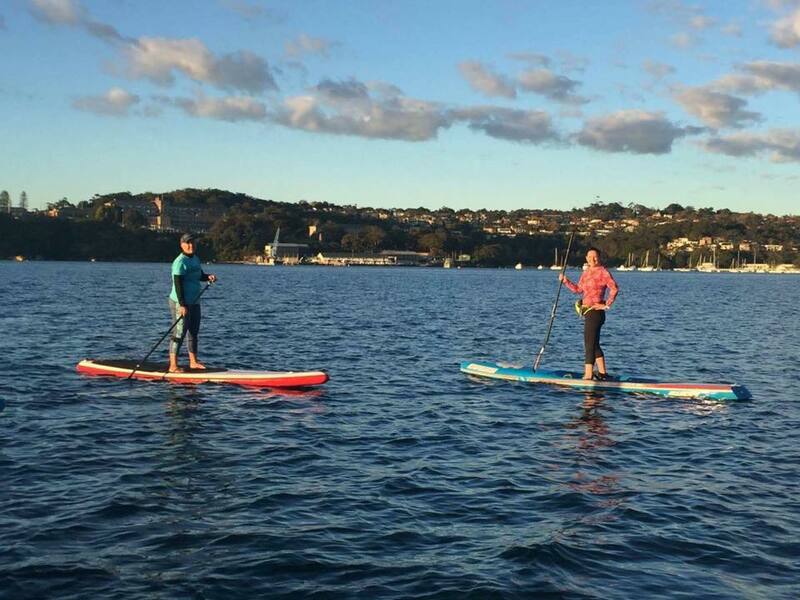 We also planned to do a social paddle with a few of our Sydney SUP mates on Saturday 3rd September, which would usually entail a leisurely paddle along Sydney Harbour and a coffee stop at one of the Harbour beaches. Although this time there was 30+ knot winds predicted, so instead we planned for an exciting downwinder across Botany Bay. We’re so thankful to Rod and Anna who were our support crew, driving the cars across to meet us at the end of the paddle in La Perouse. We started the paddle at Dolls Point. It was so windy at the beginning some of us needed help just carrying our boards down to the beach. Once we set off there was no stopping us. With a 30-35 knot wind behind us, we were racing towards the finish line. It was a little bumpy and we fell in quite a few times, which made it even more fun! It’s a little tricky getting back on your board in windy and choppy conditions – which is exactly the reason downwinders are only for experienced paddlers, and why we all wear PFD’s (personal floation devices) and carry mobile phones. Andrew set the record for the top speed across the bay that day at 20km/hour, closely followed by Traci at 19km/hour. Everyone had a great time, and Andrew was heading asking “can we do it again?”. Boards were loaded and we stopped for well earned fish & chips at the Georges River 16ft Sailing Club. 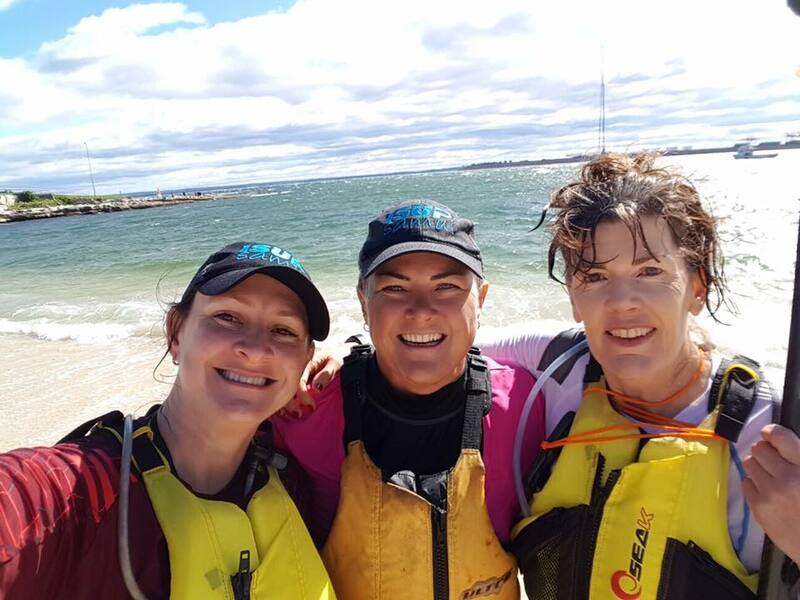 Friends who paddle together… here we are with our Sydney SUP mates after the downwinder across Botany Bay! Yeew! Tammy with our Sydney SUP mates, Traci and Rebecca! Just after the downwinder across Botany Bay. If you’re traveling to Australia, get in touch with us first and we’ll suggest some great places to paddle and friendly people to contact for SUP lessons and tours. Meanwhile, we’re back in Koh Samui now. So don’t forget to plan a stopover in Samui on your way to Australia – and come out on the water with us! Contact us today! Island Hopping: Getting from Koh Samui to Koh Phangan on a Stand Up Paddleboard (SUP). The islands of Koh Samui and Koh Phangan are located in the Gulf of Thailand, about 700km south of Bangkok. There’s a regular ferry that takes about 50 minutes to cross from one island to the next, costing just 200 Baht each way. Last month a group of adventurous paddlers decided to ignore this cheap and easy option and paddle across from Koh Samui to Koh Phangan on their Stand Up Paddle boards instead. 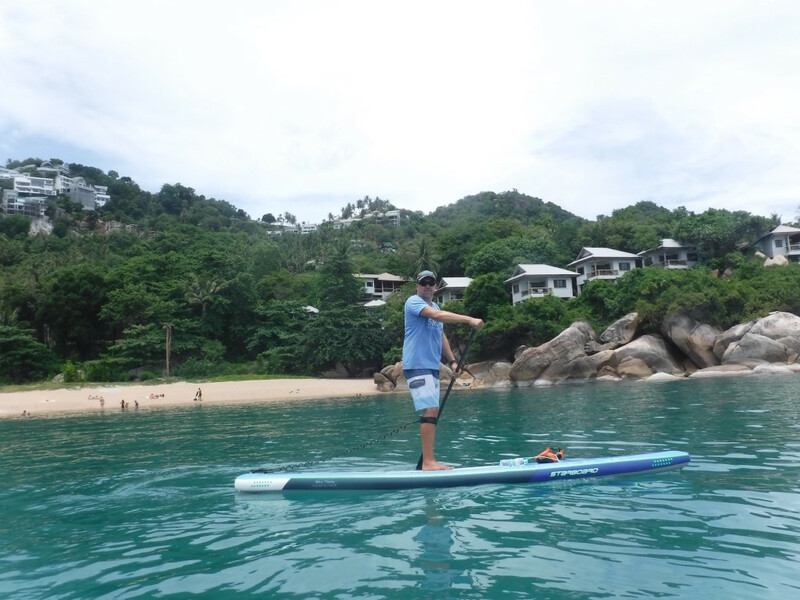 Ian Wade, owner and SUP Instructor at iSUP SamuI, has been dreaming of paddling from Koh Samui to Koh Phangan for the past few years. He can see the outline of Koh Phangan from the balcony in Samui, and often wondered what it would be like to cover the 10 kilometre crossing by paddle board. He was just waiting for suitable weather conditions and a group of like-minded adventurous paddle boarders to join him. Despite being the hottest time of the year in Thailand, the conditions on the water in May were ideal for an island crossing. After researching the winds, tides and currents a date was decided upon. A group of 4 experienced paddlers planned to paddle from Koh Samui to Koh Phangan on 12 May 2016. With several years of paddling around the east coast of Australia and around the islands of south-east Thailand the group had the experience to take on such a challenge. 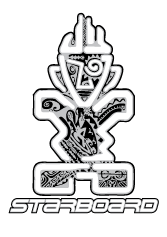 They also had access to premium Starboard paddle board equipment from iSUP Samui, a mobile SUP school based in Koh Samui with extensive experience of SUP conditions around the island. The group left Koh Samui at 6:30am on Tuesday 12th of May. They paddled out out from the calm waters of Choeng Mon beach and headed north towards Koh Phangan. Conditions were great with calm waters and a light breeze for the duration of the paddle. “It was motivating to see Koh Phangan getting closer and closer as we paddled past the halfway mark. 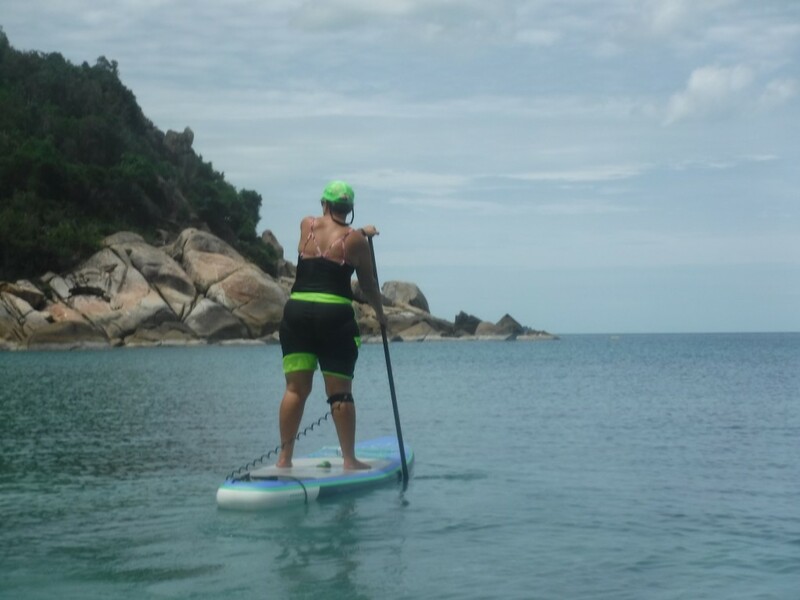 We kept a steady pace of 4.2 km/hour and stopped every 30 minutes for breaks, so it took us 3 hours to paddle the 12.9km distance across to Koh Phangan” said Tammy Wade, owner and SUP Instructor at iSUP Samui. “We were excited to join Ian and Tammy on their first paddle across from Koh Samui to Koh Phangan. Highlights included paddling past traditional Thai fishing boats that were making their way back to Samui with their overnight catch. I don’t think the fishermen expected to see us out there” said Traci Dostalek. The group of four hungry paddlers arrived at Leela Beach (on the south west corner of Koh Phangan) around 9:30am, just in time for a well-earned buffet breakfast. It’s just too hot in Thailand to consider paddling back to Koh Samui in the midday sun, so a 27’ catamaran was waiting at Leela Beach to take the group and the paddle boards back to Samui. Perhaps next time we’ll stay overnight and explore more of the Koh Phangan coastline. Happy and hungry paddlers arriving at Koh Phangan: Traci Dostalek, Rod Dostalek, Tammy Wade, Ian Wade. Taking a break somewhere halfway between the two islands. Join us for a social paddle at Choeng Mon beach and a cool refreshment afterwards. Bring your own paddle board, or reserve one of our boards (special rate: 300 Baht for Samui residents). Sunday Social SUP is for experienced paddlers. Beginners should book in for a lesson first. Meeting place: https://goo.gl/maps/nFWP3m2GnTt (between Crystal Restaurant and Choeng Mon beach resort, near the jetskis). We’ve been visiting Koh Samui for the past 15 years, and we moved here in June 2015 to setup iSUP Samui. We stay in the north-east part of the island, an area called Plai Laem, and we mostly paddle in the areas around Choeng Mon, Bangrak, Bophut and sometimes Maenam. We also make trips to the south of the island because we love the chilled out feeling at Lipa Noi, Taling Ngam and Tong Krut. This is a work in process blog post about the beaches where we paddle. I’ve included some suggestions on accommodation in these areas to help you plan your holiday, and will add some photos of the beaches in the next few days. Disclaimer: We are not being paid anything by these hotels, and we have not stayed at any of them. It’s just a starting point of a few hotels that are close to the areas where we paddle. Before booking your accommodation I’d recommend reading the reviews on sites like TripAdvisor and also checking out one of the many hotel deal sites to get the best rate. Also, you might like to check the location of these hotels on Google Maps, and then research some of the nearby hotels. Hope to see you in Samui some day. Choeng Mon beach usually has calm and flat waters between April and October (the summer months of Thailand). During these months, the water is quite clear and inviting. This beach is a favourite swimming spot for many expats living in Samui. The water is quite shallow near the shore which makes it ideal for families with young children. It’s also good for couples, and we enjoy walking along the white sandy shoreline during sunrise and sunset. There’s quite a few restaurants, bars and shops within walking distance from the beach. There’s also an ATM, pharmacies and a 7-11 convenience store. We like paddle boarding at Bangrak beach because the water is calm for most of the year, and it’s nearby to Big Buddha and the island of Koh Som. It’s quite a big bay so there’s plenty of coastline to explore, and it’s a lovely long beach for a morning or afternoon walk. It’s not the prettiest beach for swimming. Many of the yachts and speed boats are moored in Bangrak, and you’ll also find the Seatran Ferry Pier which will take you to Koh Phangan and Koh Tao. If you’re looking for a convenient place to stay, you’ll find lots of shops, restaurants, bars and massage shops in the Bangrak area. Plai Laem is a little sleepy area on the north eastern point of Koh Samui. There are many villas in this area, and you can probably find them on sites like AirBNB. The beach in front of Arayaburi is good for swimming during the summer months (April – October). It’s a small bay and can be a little rocky so we don’t paddle from this beach. The other beach is Big Buddha beach, it’s quiet and nice for morning and afternoon walks on the beach, but it’s not great for swimming or paddling. Tongson Bay is a quiet beach in the Plai Laem area. Depending on the weather we can easily paddle from Tongson Bay around to Choeng Mon or the island of Koh Som. There’s only a couple of hotels on the beach. If you stay here I’d recommend booking a rental car or motorbike so you can drive to the nearby shops, restaurants and bars in Choeng Mon or Bangrak. Bophut Fishermans Village is a sleepy little village during the day, and a lovely spot for dinner and drinks in the evening. It’s a great spot to stay if you don’t want to bother renting a car or a bike, because you can just stroll along from your hotel to the many bars, restaurants and shops in the village. There’s a couple of yoga studios in the village and great coffee shops too. And it’s easy to get a taxis and public transport out of the village to other areas on the island. Maenam is a big bay with a long stretch of white sand. Most of the beach is lined with coconut trees which makes it a peaceful and shady place to hang out for a few hours. The water gets deep quite quickly, and is usually nice for swimming and paddling. On the west end of the beach you’ll find the Lomprayah Ferry which will take you to Koh Phangan and Koh Tao. We love the quiet stretch along the east end of the beach near The Treehouse – it’s a favourite spot for our paddle tours, and we often stay for the yummy lunches in their restaurant. Let me know if you have some favourite places to stay in the area that you’d like to share with other travellers, and I’ll add them to the list. For more information on our favourite Thai restaurants around the island, check out our Guide to Thai Restaurants in Koh Samui. Imagine this. You’ve been paddling along the Samui coastline for about an hour, with a light breeze over your shoulder. You can hear the chilled beats coming from a nearby beach bar. There’s oversized bean bags on the beach. And an extensive cocktail menu. Welcome to Coco Tam’s – one of our favourite beach bars. It’s also the beach where we end our Chilled Out Sunset SUP and Cocktails Tour. This tour is a destination paddle, which means we start at one beach and finish at another. We start the tour at Bangrak Beach (near Big Buddha) around 4pm. We paddle across the bay for about an hour, and then paddle across to Bophut Fisherman’s Village. We paddle right onto the beach in front of Coco Tam’s beach bar, claim our bean bags, and order our sunset cocktails.  You’ll be accompanied by one of our qualified SUP Instructors, who will make sure you land at the right beach and also pass on a few tips to improve your paddling. Our second Instructor drives the car around to meet you in Bophut, so we can pack up the boards and head back after your cocktail. Tour Cost: 1500 Baht (includes paddling equipment, drinking water and 1 cocktail). Suitable for experienced paddlers, and those who’ve had a lesson. You should be a confident swimmer if you’re going to join this tour. Complimentary beach transfers provided if you’re staying in the Choeng Mon, Bangrak or Bophut areas. For more information about our Chilled Out Sunset SUP and Cocktails Tour, email [email protected] or call +66 92 737 9705.